In 1933, a Machinist's Mate on the heavy cruiser USS Indianapolis Gerhard Stoeckel, Sr. of Allentown, Pennsylvania., snapped a photo of FDR during his visit to the ship and stowed it away in a scrapbook. It was found by his son and used by his daughter as a "show and tell" at her school. When Stoeckel Jr. subsequently heard that only two photos of FDR in a wheelchair were known he contacted the FDR Library and one of the archivists, Mark Renovitch, confirmed the authenticity. The keel of the Indianapolis was laid in 1932. In 1933 it picked up FDR at Campobello and transported him stateside. This was the first time the President was a guest on the ship. He again boarded it in May 1934 to review the Navy in New York Harbor but never donned casual clothing. Numerous photos from this day are known, most of which with FDR under on the the large guns with various dignitaries and family members. Again 1936, FDR chose the Indianapolis for his "friendship cruise" to South America. Gus Gennerich died on this cruise while having dinner in a restaurant in Buenos Aires. The much admired aide was given a state funeral by FDR. The man on the left is August Adolph "Gus" Gennerich. To his his left, the rumpled man is Louis McHenry Howe, the political genius most responsible for FDR's ascendency to the presidency. Howe died in early 1936 and this unfortunate fact unequivocally excludes 1936 as a possible date for the photo, since Howe died earlier in that year. The photo is unfortunately of poor resolution since it was an AP wirephoto, essentially a fax. Despite the appearance of a 1999 article in the Allentown Morning Call, the discovery of this important photograph failed to be widely noticed. The text of the original article, sleuthed out by my co-author Eric Fettmann, appears below. It contains numerous historical inaccuracies, though importantly, it identifies that Stoeckel had been stationed on the Indianapolis since 1932. Thanks to FDRL archivist, Bob Clark for his impeccable research in identifying the correct date of the photo. My copy of the photo now resides at the FDRL, where it will soon be placed on display. Enjoy a piece of history! CAPTURED THIRD KNOWN PHOTOGRAPH OF FDR IN A WHEELCHAIR. In an era when there was no official White House photographer, President Franklin Delano Roosevelt was probably the most photographed man in the nation. More than 25,000 images of him are on file at the FDR Presidential Library in Hyde Park, N.Y, most of them taken by news photographers who willingly adhered to a strict ruling by theRoosevelt family that the president was not to be photographed in his wheelchair. Only two photographs of FDR in his wheelchair have been known to exist -until now. The photograph accompanying this story is the third. It was taken more than 60 years ago, in 1936, by Gerhard Stoeckel Sr. of Allentown, while he was a chief machinist's mate on board the heavy cruiser USS Indianapolis on which Rooseveltsailed to Latin America for what was called "The Good Neighbor Cruise." The historic photograph has laid all these years in a scrapbook retained by Stoeckel's son, Gerhard Stoeckel Jr., 69, of 1536 Liberty St.
Stoeckel Jr. rediscovered the photo after reading a recent article stating that only two photos exist of FDR in a wheelchair. Only then did Stoeckel realize what he had. He knew he had a photo of FDR in his house, and it was one of the president in a wheelchair. Mark Renovitch, archivist at the Hyde Park library, confirmed the find. "We have for years told anybody who called us that there were only two. Now we have to correct what we've been saying all these years." Renovitch said he would love to see Stoeckel's photo join the library's collection. The cruise began on Nov. 18, 1936, shortly after Roosevelt was overwhelmingly re-elected for his second term. Accompanying him were his bodyguard August "Gus" Gennerich; FDR's physician, Dr. Marvin McIntyre; his military aide Edwin "Pa" Watson and the president's son, James. Allentown educator Dr. John J. McHugh, who has studied FDR and the Roosevelt family since 1945, believes the civilians in the photo with the president are Gennerich and McIntyre. The Hyde Park library confirmed that it is, indeed, Gennerich standing at the left. They were not able to confirm if the man next to Roosevelt is McIntyre, based on the fax sent them. The fact that it is Gennerich shows that the picture was taken on the way to Latin America because Gennerich died Dec. 1 of a heart attack while in Buenos Aires. It is probably the last picture taken of the man who had been the president's faithful aide since 1928. "Gus was Franklin Roosevelt's legs," said McHugh. He was a New York cop who met FDR in Albany while he was the governor. Gus was a jovial man who loved to tell stories, McHugh said. "Gus was his best buddy and his protector. "He had a special place at the White House where he would sit at the door with a big dog that he owned. "He took precedence over everybody else, including the Secret Service, and Roosevelt thought so highly of him, he gave Gus a White House burial. His body lie in state in the East Room of the White House, an honor usually reserved for only the president." The Stoeckel picture surfaced about 15 years ago when Stoeckel Jr.'s son, Gerhard Stoeckel III, made an enlargement of the scrapbook picture so his daughter, Holly, could take it to a grade school show-and-tell. Neither little Holly, now 26 and a teacher in Myerstown, nor her family or classmates at McKinley School had any idea how rare a piece of history was on display in the classroom that day. It was just another day at school and the picture was returned to the family files -- until last week. Gerhard Stoeckel Sr. was born in Kemetz, Germany in 1900, but his family had emigrated to Allentown where his father worked as a shoemaker. Gerhard left school, worked at the Bonney Forge Tool and Die shop for a spell and then joined the Navy in 1919, on the condition set by his parents that he continue to send money home to help the family. Stoeckel thrived on Navy life, finishing first in his class at machinist's school and eventually rising to the enlisted rank of chief petty officer. He had been on board the cruiser Indianapolis since 1932 and was ranking CPO in the engine room when the president came aboard. For Franklin Roosevelt, being at sea was the greatest tonic, notes McHugh. His physician was constantly after him to take a vacation, so FDR combined his love of the Navy, his need for a vacation and the political need to establish good relations with Latin America. The president had made other cruises on the USS Indianapolis, said Stoeckel Jr. His father told him that the cruiser had an elevator installed expressly for FDR so he could move from deck to deck. Stoeckel Jr. relates a tale about the time his dad "put the lights out for the president." The president wanted more light in his room, so an officer was dispatched to the engine room where Chief Stoeckel was at his station. "The president wants more light," he was told. "Can you give any more electric power?" "I have one more generator," Chief Stoeckel said. "Give me 20 minutes." Had he been given the time to build up more steam, everything would have been fine. But like a good sailor, when you get an order you do it, his son said. "He turned on the last generator and everything went black." But it didn't seem to hurt his career. He stayed on board the Indianapolis until 1939 and was discharged from the service Dec. 10, 1940. It was a short departure, however, because he went right back to serve his country and his Commander in Chief again when World War II began. "After training 20 years for war," he told his son, "it would be like turning your back on your country. Eventually father and son both would serve in the Navy during the war. As a footnote to the story, Chief Stoeckel was aboard another ship when it was sunk off Casa Blanca during the war, and he lived to tell about it. After the war he returned to Allentown and worked at Bethlehem Steel until he retired. He died in 1980 at the age of 80. His old ship, the USS Indianapolis, was sunk at 12:15 a.m. July 30, 1945, by two torpedoes from the Japanese sub I-58. The cruiser capsized and sank within two minutes, with no S.O.S. sent out. Only 318 of her crew of 1,199 survived. Many were lost to sharks. 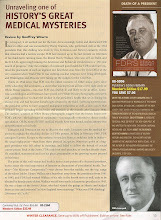 Franklin Roosevelt became an invalid in 1921. He lived the last 24 years of his 63-year life disabled by polio. The first wheelchair photos were taken by Margaret "Daisy" Suckley (pronounced "Bookley"), according to McHugh. "Margaret Suckley was a distant cousin of FDR's, but during his presidency she became his closest companion," McHugh said. "She was a remarkable woman who dedicated her life to the president. She was the only person with whom he would talk confidentially," McHugh added. McHugh met and interviewed Suckley often, he said, but she would always deflect personal questions about her relationship with the president. She took her story with her when she died at the age of 100. She willed her estate Wilderstein to a preservation group that discovered a steamer trunk under her bed filled with diaries, letters and memorabilia of the president, including the two previous wheelchair photos. One is a frontal photo of the president, his dog Fala in his lap, and a 5-year-old girl named Ruthie Bie, by his side. The second is a photo from the rear showing FDR's broad shoulders against the wheelchair, which actually was a homemade contraption made from a cutdown kitchen chair. The photos wound up with Geoffrey C. Ward, the former editor of American Heritage Magazine, who turned the material into a book, "Closest Companion: The Unknown Story of the Intimate Friendship between Franklin Roosevelt and Margaret Suckley." Ward, questioned about the possibility of other photos of the type, said, "Probably in the world there may be others." There may have been a Life magazine picture taken at great distance of FDR being wheeled to his library at Hyde Park, Ward said, but he didn't look it up. "No other pictures of him in a wheelchair were ever published in his lifetime," he said. Another cherished possession of the Stoeckel family is an official "Shellback" certificate signed by the president. Among the letters in "Closest Companion" is a letter from FDR to Daisy that confirms The King Neptune Ceremony as a highlight of the cruise for the men and the president. "Monday 23 -- All is preparation for the Crossing of the Equator -- I am the Senior Pollywog ... at 7:30 tonight there was a loud beating of drums and blowing of bugles ... announcing that at noon tomorrow Father Neptune & his court will come on board to initiate all Pollywogs into the mysteries of the deep & make them into Shellbacks! "As a matter of fact, I got off very lightly -- The King, Queen, Royal Baby & a large Court retinue appeared in the most gorgeous costumes, were duly seated on a platform & then the fun began -- I had to make a speech in defense -- but the others were dunked in a tank, put in a coffin, "electrocuted," spanked, tickled, etc. -- over 200 of them & it lasted from noon till 4. "Weds. 25 -- All on board have settled down to the usual routine after the 'show' of the past two days -- and I slept till ten this morning ... I spend spare moments signing the King Neptune certificates -- big colored affairs -for the whole ship's company -- about 700 of them!" It appears that FDR was much more thrilled with being a Shellback than being a goodwill ambassador. With the death of his buddy, Gus, the joyous cruise was turned into a somber journey home, where he would return to all the problems that awaited.